Talat sold Malik down the river after responding to the call. While technology has definitely made the umpires’ life easier on a cricket field, sometimes even the technology fails to come to a conclusion or a rather quick conclusion. Something similar was seen when South Africa and Pakistan locked horns in the third T20I at the SuperSport Park, Centurion on Wednesday. The TV umpire had to wait for quite a good number of minutes before finally giving his verdict on who was out after Shoaib Malik and Hussain Talat were involved in a misunderstanding. The incident occurred on the second delivery of the 12th over when Malik flicked a Tabraiz Shamsi delivery towards short fine leg. As soon as Malik hit the shot, he rushed through and called his partner for a quick single only to see Talat hesitating. Talat had come out momentarily but soon turned his back to his skipper after realising the danger. 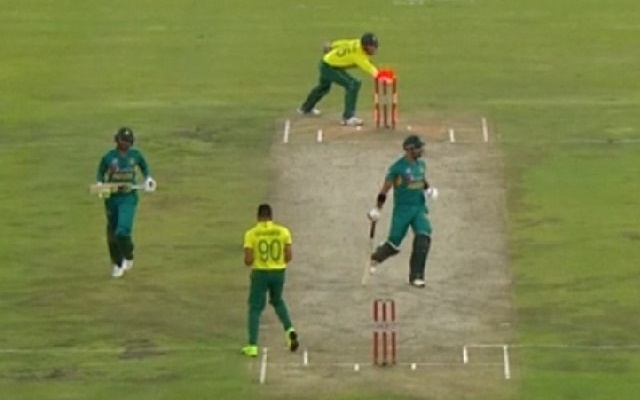 Malik, however, had set off and by the time he could return to his crease, Andile Phehlukwayo had thrown the ball to the wicketkeeper who did the rest. The drama started from here on. Both Talat and Malik looked like standing at the same spot when the bails were dispatched. Unable to give the verdict, the on-field umpire referred the decision to the third umpire. However, the third umpire did not find it easy either but finally gave his decision after nearly 7-8 minutes, adjudging Shoaib Malik out. Pakistan, meanwhile, beat South Africa by 27 runs in the third and final match of the series to register their first win of the series and deny the hosts a whitewash. Batting first, the visitors scored 168/9 with Mohammad Rizwan’s 26 being the highest score. For South Africa, Beuran Hendricks bagged 4 for 14. However, Hendricks’ heroics with the ball went in vain as the Proteas could only muster 141 for 9 with Rassie van der Dussen (41 off 35) and Chris Morris (55* off 29) the only batsmen to make useful contributions.